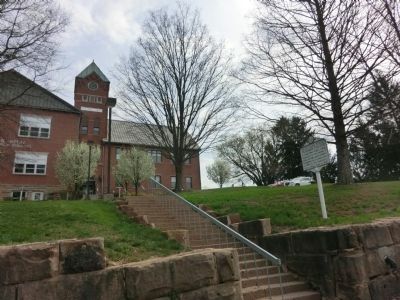 A central West Virginia college maintained for the training of grade and high school teachers. Established as a normal school in 1872 by the Legislature. Given college status in 1930. Location. 38° 56.082′ N, 80° 50.016′ W. Marker is in Glenville, West Virginia, in Gilmer County. Marker is on N. Court Street. Touch for map. Marker is in this post office area: Glenville WV 26351, United States of America. Touch for directions. Other nearby markers. At least 8 other markers are within 8 miles of this marker, measured as the crow flies. Glenville State College (about 400 feet away, measured in a direct line); Attack on Glenville (about 600 feet away); Fort Moore (about 700 feet away); Glenville (approx. 0.2 miles away); Samuel Lewis Hays (approx. 0.9 miles away); Duck Run Cable Suspension Bridge (approx. 2½ miles away); Stagecoach Stop (approx. 7.2 miles away); Braxton County/Gilmore County (approx. 8 miles away). Touch for a list and map of all markers in Glenville. More. 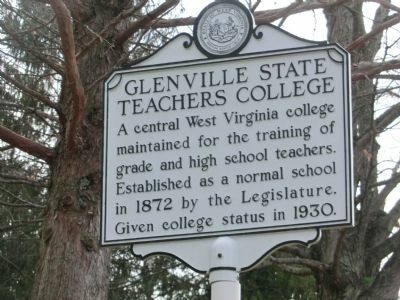 Search the internet for Glenville State Teachers College. Credits. This page was last revised on June 16, 2016. This page originally submitted on May 4, 2014, by Don Morfe of Baltimore, Maryland. This page has been viewed 365 times since then and 4 times this year. Photos: 1, 2. submitted on May 4, 2014, by Don Morfe of Baltimore, Maryland. • Bill Pfingsten was the editor who published this page.